I have always wanted to get into shape and have fun. What is CARA? CARA is the Chatham Area Rowing Association, LLC. CARA is the umbrella name for a host of programs that will all run out of the boathouse at various points of the year. Among the programs offered include those targeted for different age groups, technical ability, commitment factor, and success goal. I don’t know what crew really is. Do I need to already know how to row? This is a big NO. The great thing about rowing is that it is relatively easy to do for everyone. We say it is easy to learn, but hard to stay consistently good. For this reason, this sport has universals themes of motivation, perseverance, and dedication. How does the League Program work? This is set up like a bowling league. Each League is divided into a 7-week session at different parts of the year. Each session will have a certain number of teams that meet once or more a week, receive coaching to get better, then in week 6 and 7 start racing against each other in roughly a 1000 meter course through Thunderbolt’s Intra-Coastal Waterway. I don’t want to eat up too much time. What are the days this happens? The League practices two days a week, MON/WED (Learn2Row,Intermediate, and Champ level Crews). In the final 7th week of each session, a race between crews will happen to get bragging rights in the boathouse. The regular water practice times are either 8:00AM-10:00AM or 6:00PM-8:00PM. There is only room for 30 people at each time slot and day. How many CARA League Teams are there? The number of teams will depend on how many people sign up. The goal is to have Teams of friends (neighbors, people from work, etc. ), professionals (doctors group, lawyers, designers, etc), theme-sets (Savannah singles, religious organizations, etc), college faculty and staff (Savannah State/SCAD/AASU), register as a group, practice, then race against the other groups for bragging rights in the Chatham Area. A celebration and trophy for the winning team marks the end of each session. Currently there are 85 members in CARA. When are the next programs? Check out our "PROGRAM" page for a complete listing of program description, dates, and times. Who are the Coaches for the League? Beside myself, are coaches Colleen Morcock, Joey Morcock, Julia Cox, and A.J. Certo. Coach AJ Certo, a former Assistant Coach for the former SCAD CREW brings his many years of coaching knowledge organizing the technical training of the College Team and Small Boat Program. Coach Colleen Morcock is a 4 year rower from the College of Charleston and works to develop our area High School program. Her husband, Joey Morcock previously coached rowing with Hilton Head High and now finds home with our CARA High School Team. Julia Cox rounds out our coaching team, helping with the College, League, and Small Boat Programs. Members of the college team also help work with the League. Teaching leadership, communication, and patience to these students through coaching better prepares them for their competition on the water and in the classroom. I am a dedicated rower that wants to train. Can I get extra practice beyond the twice a week program schedule? Yes. The CARA programs are all designed to work together for a complete training schedule. A member that wants to practice at a competitive level can do so by signing up for several programs through the week. Often, program fees are reduced if already enrolled in another CARA program. Where is the boathouse and training facility? We practice out of the Savannah Bend Marina. It is owned by Sea Ray of Savannah and has housed our crew since 1994. 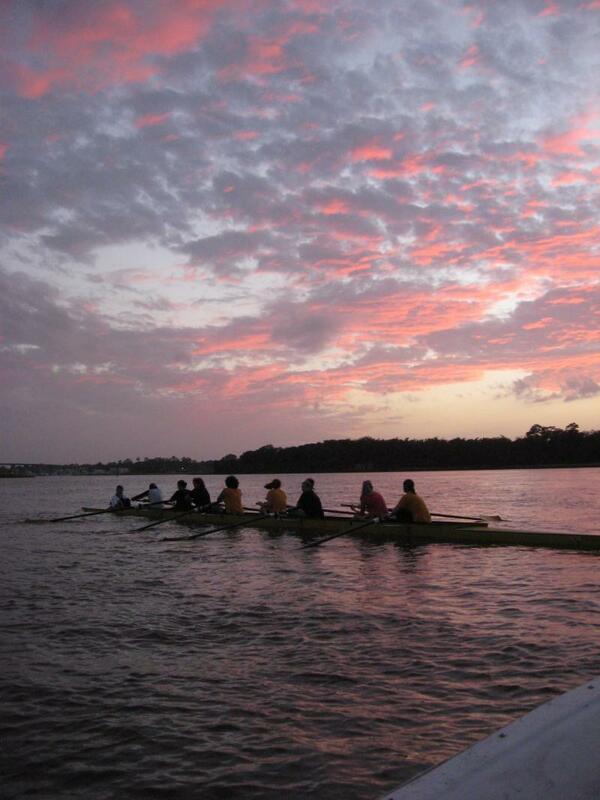 We row on the Intra-Coastal Waterway, locally referred to as the Wilmington River. What happens at a practice? Each practice you will run equipment down to the water, stretch-out, launch, receive coaching and row. The equipment is then washed, put away, a coaches review, and you’re done. There are showers and small lockers available on site. What is the swim test and intro lesson entail? It is important that your comfortable around water. The swim test is two laps in a pool (any style of stroke) and then tread water immediately after for 10 minutes. You will wear sweat pants and a long shirt for the test. This test will happen in week 4 of the CREWCORE program. Being able to pass this swim test is required to join an on-water CARA program. What is the fee structure to join? If you want to join and do so by yourself, the cost is $275.00. Returning CARA members stay at the 225.00 fee. This fee applies to each 7-week session. I am not in college, over 21, and looking to meet other professionals in town. Will this be all work and no play? This will depend. Some people want to really do this on a competitive level, others want to join to meet people and get in shape. The team will evolve to have Beginning, Intermediate, and Advanced level programs. Simply stay in the level of program that best suites you. Over all, this is a social group so cookouts and surrounding activities will require that you're 21. How do I keep in touch with everyone that is going to be part of CARA? All the current club, group pages, and contact information is at www.rowsavannah.com. We are still at our beginning, but this site will remain our base on the web. We are also on www.facebook.com and www.myspace.com community sites. Ok, so how do I register to join? Contact us here on our contact page at www.rowsavannah.com. Make sure to leave which program your interested in and we'll get back to you. "Everyone always has questions about getting invloved with crew and I have tried to answer specifically those about the CARA League Program. For questions about our High School and College Teams, we have set up interest meeting that are posted on our Program Page. There is a lot of information already on the internet about rowing. In everything you read, it is important to understand that rowing appeals to all ages, sizes, and reason for joining. A boat and it's crew can go fast, work hard, and push you to your limit or a a boat and it's crew can go slower, work easier, and focus on getting in shape."